In today's blog we take a look at South Africa's exports per modality. I.e the way in which it leaves the borders of South Africa. Do the goods we export leave our border by land, air, sea or other forms? We take a look at the data below. Land vs Sea vs Air vs "Other"
The bar chart below shows the percentage of South Africa's exports per modality for various time periods. And as can be seen the majority of South Africa's exports leaves our borders by Sea. Largely massive amounts of commodities such as coal and iron and steel that South Africa ships to India, China, USA and EU members such as Germany. Guess it should be no surprise that around half of South Africa's exports leaves our borders via the sea, as the majority of South Africa's exports are commodities such as coal, iron ore and steel products, PGM metals etc, all of which require specialist shipping vessels and cannot be expected to be flown to countries buying our commodities as planes would never be able to move such heavy materials and in such large quantities that shipping vessels are able to move. Surprising to some would be the contribution of land to South Africa's exports. This is basically large scale exports from South Africa to Botswana, Lesotho, Namibia and Swaziland (BLNS) but not limited to these countries, but they do make up a major chunk of South African exports that leave our borders via Land border posts. Others include Zimbabwe, Zambia and Mozambique, but the main driver of South Africa's land exports is to Botswana. 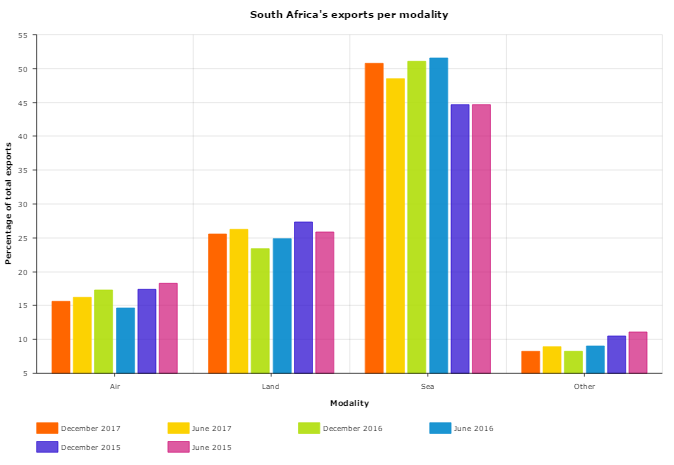 While there are some fluctuations as to the relative importance of the modes with which exports leaves South Africa's borders, there is not significant shift or change in trend that has take place over the past couple of years.